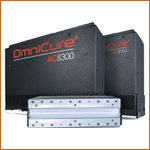 The OmniCure AC8 Series air-cooled UV LED curing systems are designed with advanced custom front-end optics to provide high-powered, high peak irradiance and exceptional uniformity at different working distances. The OmniCure® AC8150/P, AC8225/P and AC8300/P air-cooled UV LED curing systems from Excelitas Technologies are designed with advanced custom front-end optics to provide high-powered, high peak irradiance and exceptional uniformity at different working distances. The systems deliver over 8 W/cm2 peak irradiance for fast, even curing at long working distances. “P” versions of the AC8 Series have enhanced optics to optimize the dose for short working distances required by print applications. By adapting the output to support the process requirements of the industry, the new AC8 Series product portfolio can be applicable for a range of varying applications with different process needs. Boasting a robust architecture, the OmniCure AC8 Series are designed to be compact while allowing for multiple UV LED heads to be adjoined, without compromising the optical uniformity between each system. The flexibility to achieve larger curing areas in a variety of customizable lengths enables manufacturers to improve throughput while maintaining maximum performance. By utilizing our patented process for addressing individual UV LED module outputs, the AC8150/P, AC8225/P, and AC8300/P provide exceptional uniformity over the entire curing area, thus improving productivity and reducing operational costs for manufacturers.